Sick and tired of having a cushion on your lap to prop up the iPad or laptop but don’t want to risk radiating your gonads? Look no further. Introducing the iBeani™ – a stylish bean bag, specifically designed to hold tablets or e-readers on any surface at the perfect angle. Tired of holding your iPad or tablet whilst lying in bed or sitting on the sofa? The iBeani is the perfect solution. Whilst other tablet stands will only work on flat surfaces, the iBeani is able to shift its shape to support and keep your device in the position you want, wherever you are. On the train, on the sofa or on a kitchen worktop, the iBeani works everywhere! What more can I say. Oh ok then. The iBeani is manufactured entirely hand made in the UK from carefully selected quality fabrics to ensure customers get the highest quality and durable product possible. There are 16 different variations of the iBeani with different materials and designs such as Harris Tweed tartan, faded blue cord, butterfly, techno black, denim, and many more coming soon to appeal to men, women and children of all ages. This blurb is lifted from the press release. I’ve started getting millions of them occasionally. The gonads bit is mine. Not the gonads themselves you understand. Just the sentence, though I am a bloke obvs. I only noticed the release because a) it’s manufactured in Nottinghamshire, just over the county border from my parish, and actually it isn’t a bad idea. I do have a cushion on my lap when using the laptop whilst sat on the settee. There ya go. A market need being fulfilled by a British company. A simple idea that just works. I liked the iBeani pirate version that you see in the featured image. Goes with the pirate flag we have when we go camping (also see it inset in this post). I’m going to have a week of writing posts in pirate speak in September in the run up to International Talk Like A Pirate day on the 19th of the month. 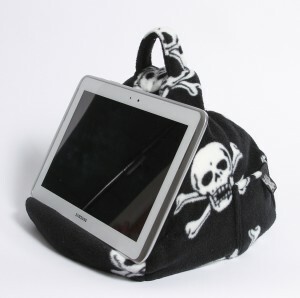 Maybe we will see if we can do a promo and sell the iBeani pirate version that week. Sounds like a plan to me. PS lets hope they don’t get pirated – we don’t want the market flooded with cheap imitations from China do we? The modern day pirates! PPS there are over 20 designs to choose from if Piracy isn’t your game, or it’s a bit frightening. Wholesale Mobile Access – a tonic for our industry?